If you are eager to be a service dog trainer and work with their handlers, our Service Dog Trainer School is the best program for you. This intensive program will help you cultivate the appropriate skill set necessary to understand how to properly select, socialize and train Service Dogs for mobility and hearing assistance as well as other psychological disabilities. The program also concentrates on training Autism Service Dogs for children and adults on the Autism Spectrum. Our service dog trainer course also covers rights and laws governing service dogs, their trainers, and their handlers. 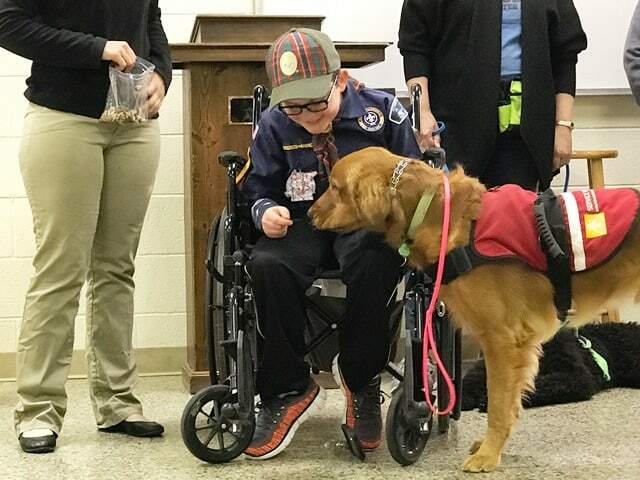 In addition to the vital training in the classroom, our service dog trainer school students have endless opportunities to work with service dogs in training out in the community. Curious to know what it’s like to attend the Service dog trainer course at our School for Dog Trainers? Click on the video above to see what a recent graduate of our program had to say about her experience in our service dog trainer course. 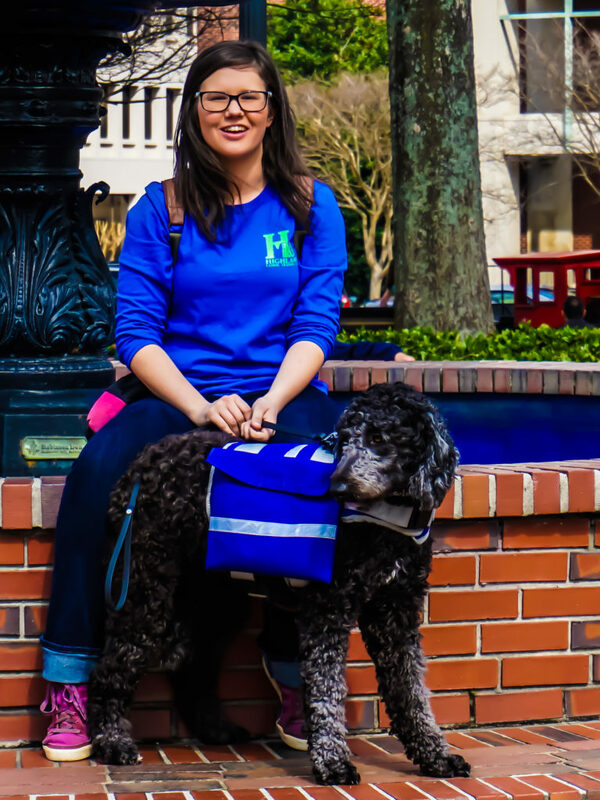 Due to the length of our program, our Service Dog Trainer Course is only offered twice per year, during our Winter (January) and Summer (July) semesters. Our Service Dog Trainer School starts on the first Monday in January and July unless those dates fall on a holiday. This program is NOT offered in our Spring and Fall semesters. 18-week Service Dog Trainer Course. Price includes deposit and program materials. Optional student housing is additional. 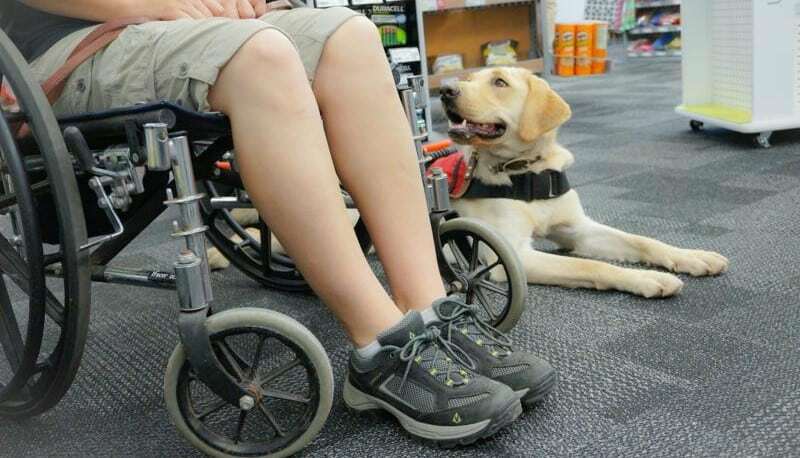 This program provides extensive hands-on instruction with a variety of service dogs and gives the student the opportunity to work with service dog candidates throughout the entire process, from selection and testing, to socialization through training the handler, this program gives you all the tools you need to be an effective service dog trainer. Our Service Dog Trainer Course focuses on teaching students to perfect a variety of skills for mobility, stability, seizure, hearing and autism service dogs. Each service dog training skill is taught in a way so that they are easy to comprehend and apply within a variety of service dog training applications. Our program tests each student in their ability to train and work with service dogs and handlers in real-life environments. Students are also afforded the opportunity to see the “inner workings” of the Service Dog Sales and Training programs offered at Highland Canine Training, LLC. This includes meeting with potential clients alongside our trainers and service dog coordinator as well as getting involved in our other work within the community. Our Service Dog Trainer Course also emphasizes the importance of environmental stability and socialization for both adult dogs as well as service dog puppies. We also work with students to ensure that they are comfortable working with and training service dogs in public areas. As such, students in our Service Dog Trainer School frequently take dogs to schools, restaurants, shopping, nursing homes and other public places for their training. In addition, this course provides an in-depth look at the Americans with Disabilities Act, Fair Housing Act and other applicable laws that pertain to service dogs and their handlers. If you are eager to become a service dog trainer, this program will give you all of the knowledge and experience you need to be successful. 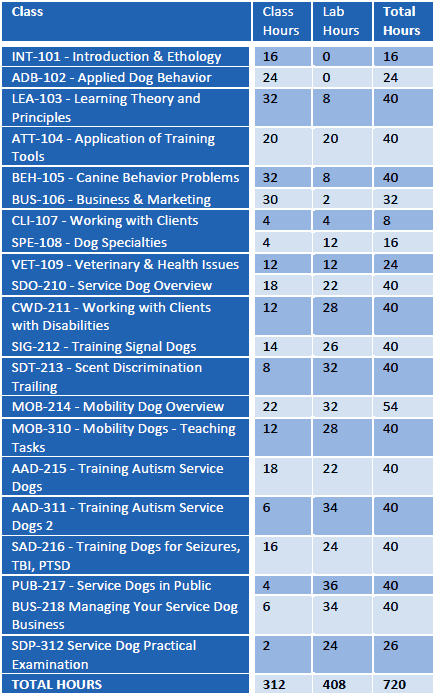 Above is a brief outline of the Service Dog Trainer Course. This outline does not cover all of the material, lectures, discussions and hands-on application that is covered during the program and is provided to give a general idea of what the curriculum covers. Practical application evaluations and written examinations occur following each week’s instruction. Our Service Dog Trainer Course offers you ample classroom training with an emphasis on hands-on experience. 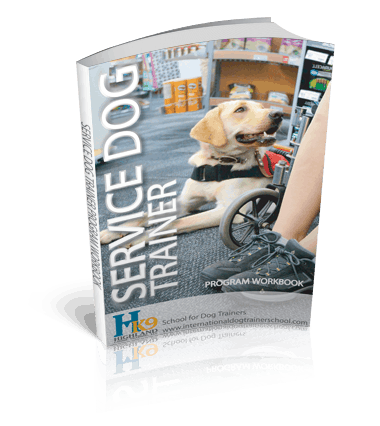 Along with our Core Course Workbook, the program also includes a Service Dog Trainer Course Workbook that has been designed by our expert instructors to guide you through each step of effectively training service dogs and their handlers. The course workbook is yours to keep and can be used as a reference after graduation. Whether you are looking to open your own business or non-profit organization, or work for a company as a professional service dog trainer, our program will ensure that you have the information and experience to be successful in the industry. Yes! You can use your GI Bill and VA benefits for our Service Dog Trainer Course. Veterans and their family members are eligible. No. There are no prerequisites for our Service Dog Trainer Course. This program will give you all the skills and knowledge that you need, regardless of experience. Our Service Dog Trainer School is different in many ways. Our expert instructors are not only teachers but more importantly practitioners. Highland Canine Training, LLC has been training skilled service dogs for over a decade through its service dog division. As such, our students have an opportunity to not only learn how to train service dogs from experts who are involved in the process every day but also have an opportunity to be immersed in this aspect of the industry. We offer students of our Service Dog Trainer Course as many opportunities as possible to work side-by-side with our various instructors who have years of experience in not only selecting and training a variety of service dogs but also with delivering them and working to effectively train their handlers. Our Service Dog Trainer School instructors have the ability to give our graduates invaluable insight that they simply can’t get anywhere else. This is accomplished by offering students operational instruction and real-time feedback while working service dogs in real world settings. Since 2006 our School for Dog Trainers has hosted students from across the globe. As such, many of our international students have attended our Service Dog Trainer Course in order to be able to return home and effectively train service dogs in their native country. Attending our Service Dog Trainer Course is a simple process, even for students traveling from outside the US. We offer airport pickup and ground transportation and can even assist with any required travel documents and paperwork. Click on the video to hear the perspective of a recent international graduate of our Service Dog Trainer Course. Start Your Career As a Professional Service Dog Trainer! Our School for Dog Trainers gives You All the Knowledge and Skills You Need to Be Successful! – Environmental Conditioning, vehicles, etc. – Opening Doors, Gates, Etc. Other Service Dogs, PTSD, TBI, Seizures, etc. – This Module of the Course Emphasizes the Importance of Environmental Stability in Public Places Through Practical Application.